This village has had a long history of successful human habitation. The first traces of human habitation in the area were recorded by renowned archaeologist Sir John Evans (1823–1908). The village sits on a saucer of clay covered by a layer of gravel, and as a result water supply has never been a problem; records show that in earlier times water could be drawn from a well just 20 feet (6.1 m) deep. In 1045 the Saxon thegn Ethelwine 'the Black' granted the upper part of Langlai to St Albans Abbey as Langlai Abbatis (Latin for Langlai of the Abbot, hence 'Abbot's Langley') the remainder being the king's Langlai. By the time of the Domesday Book in 1086 the village was inhabited by 19 families. 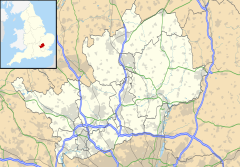 The area was split into four manors, Abbots Langley, Langleybury, Chambersbury, and Hyde. In 1539, Henry VIII, seized Abbots Langley and sold it to his military engineer Sir Richard Lee. The Manor of Abbots Langley was bequeathed by Francis Combe in his will of 1641 jointly to Sidney Sussex College, Cambridge and Trinity College, Oxford. The manors of Langleybury and Chambersbury passed through the Ibgrave and Child families, and in 1711 were conveyed to Sir Robert Raymond then Solicitor General later Attorney General and Lord Chief Justice of the King's Bench. On the death of his son without issue in 1756 the manors passed to the Filmer family. The Manor of Hyde passed to Edward Strong in 1714, through his daughter to Sir John Strange, who left the manor to be shared between his children and their descendents (including Admiral Sir George Strong Nares) and then to the possession of F.M. Nares & Co which sold the estate to the British Land Company in 1858. On Tibbs Hill Road there is a well-preserved example of a Prince Albert's Model Cottage. The original design and construction was for the Great Exhibition of 1851, to demonstrate model housing for the poor. Subsequently, the design was replicated in several other locations, including Abbots Langley. Kitters Green developed as a separate hamlet by Manor House. The land between Kitters Green and Abbots Langley was bought from the estate of Sarah Smith by the British Land Company in 1866. It laid out plots for development along Adrian, Breakspear, Garden and Popes roads. The development of these plots led to the merger of the two settlements and the loss of Kitters Green's separate identity. To the west of Manor House Park is a legendary sledging hill called Blackhill. This leads to a wooded area called the Dell. The recent Katherine Place development has brought in some high class retailers to the centre and was sold for £2.93 million in December 2005. To the south of the village are Leavesden Film Studios, on the former RAF and later Rolls-Royce airfield, where scenes from movies including GoldenEye, Sleepy Hollow and the Harry Potter series have been filmed. Bedmond, a village that is administratively part of Abbots Langley, is the birthplace of Nicholas Breakspear (later Pope Adrian IV), the only Englishman to ever be Pope, who is believed to have been born at Breakspear Farm c. 1100. The site where his home stood is marked by a plaque. [a] The village of Abbots Langley contains several roads named after its famous inhabitant (Adrian, Breakspear, Pope), and at one time included activities[vague] of the Brakspear Brewery. The church includes a window with the inscription To the Glory of God in memory of George Turnbull C.E. born 1809 died 1889. The civil engineer Turnbull was said by the Indian government to be the First railway engineer of India: in his retirement to Rosehill, a house in Abbots Langley, he was instrumental in establishing a drainage and sewerage scheme for the village, including writing a June 1880 report. The window was donated by his wife Fanny. Abbots Langley Cricket Club is the local community club honouring the parish with trophies and spectacular games of Cricket over the past years. Abbots Langley FC, the local side who currently play in the West Herts Saturday League using the facilities at the nearby Leavesden Country Park. Evergreen (Saturday) in the Herts Senior County League. Manuel Almunia (born 1977), former professional footballer. Nick Blinko (born 1961), artist and singer/songwriter/guitarist of Rudimentary Peni. Pope Adrian IV (fl. 1100–1159), born in Abbots Langley as Nicholas Breakspear. James Cecil, 1st Marquess of Salisbury (1748–1823) probably lived at Cecil Lodge 1760s–80. Violet Cressy-Marcks (1895–1970), explorer and journalist, lived at Hazelwood (now Hunton Park) 1930–70. David Crighton, (1942–2000), mathematician, educated at Abbots Langley primary school. Joan Evans (art historian) (1893–1977), historian of mediaeval art. John Evans (archaeologist) (1823–1908), archaeologist and geologist, married and buried, St Lawrence Church, Abbots Langley. Elizabeth Greenhill, (1615–1679), mother of 37 single births and one set of twins. Thomas Greenhill (1669–1740), surgeon to Henry Howard, 7th Duke of Norfolk and 39th and last child of Elizabeth Greenhill. Michael Gregsten (1924–1961), physicist at the Road Research Laboratory, victim of James Hanratty in the 1961 "A6 murder" for whose death he hanged. Ollie Halsall (1949–1992), influential rock/jazz guitarist and vibraphone player, lived here and recorded an album titled "Abbot's Langley" in 1980. Robert Kindersley, 1st Baron Kindersley (1871–1954), businessman, stockbroker, merchant banker, and public servant, lived at Langley House 1906–23. Joe Lane (1892–1959), former professional footballer. Marghanita Laski (1915–88), journalist and novelist, lived at Abbots House 1937–45. Eryl McNally, former Labour MEP. Henry Montagu, 6th Baron Rokeby (1798–1883), soldier, lived at Hazelwood 1838–86. Robert Raymond, 1st Baron Raymond (1673–1733), politician and judge, lived at Langleybury 1711–33. Haile Selassie (1892–1975), spent the early part of his exile from Ethiopia at Hazelwood. Edward Skoyles (1923–2008) researcher and quantity surveyor. William Henry Smith (politician) (1825–91), member of the W H Smith station newsagent and bookselling family, lived at Cecil Lodge 1864–70. George Turnbull (1809–1878), civil engineer (the "first railway engineer of India"), retired to Rosehill, Abbots Langley. Bradley Walsh (born 1960), entertainer lived in Breakspear Road. Mark Walsh (born 1965), professional darts player within the Professional Darts Corporation. Nicky Stevens (born 1951), singer with The Brotherhood of Man, lived in Abbots Road. Judy Grinham (born 1939), former British competitive swimmer, Olympic gold medallist, and former world record-holder lives in The Crescent. ^ "Civil Parish population 2011". Neighbourhood Statistics. Office for National Statistics. Retrieved 24 October 2016. ^ a b Hastie, Scott (1993). Abbots Langley—A Hertfordshire Village. Abbots Langley: Abbots Langley Parish Council. ISBN 0-9520929-0-5. ^ a b Clark, Clive W. (1997). Abbots Langley Then 1760–1960. Cockfosters, Hertfordshire: Clive W. Clark. ISBN 0-9531473-0-4. ^ William Page, ed. (1908). "Abbots Langley". A History of the County of Hertford. Victoria County History. 2. pp. 323–328. Retrieved 11 March 2009. ^ Welch, Jon (12 March 2013). "Nicholas Breakspear: The only English Pope". BBC News Online. BBC. Retrieved 24 September 2017. ^ Luncarty's Engineer: A short biography by John Andrews of Luncarty, West Stormont Historical Society, 2018, page 50, 51 pages. ^ "TheFA.com – Find a Club". Archived from the original on 9 May 2008. Retrieved 23 May 2008. ^ a b c d e f g Hastie, Scott (1993). Abbots Langley—A Hertfordshire Village. Abbots Langley: Abbots Langley Parish Council. ISBN 0-9520929-0-5. ^ Barnes, James J.; and Patience P. Barnes (1987). James Vincent Murphy : Translator and Interpreter of Fascist Europe, 1880–1946. Rowman & Littlefield Publishers. ISBN 0-8191-6054-7. ^ Hastie, Scott (1996). A Hertfordshire Valley. Kings Langley: Alpine Press. p. 96. ISBN 0-9528631-0-3. ^ George Turnbull, C.E. 437-page memoirs published privately 1893; National Library Edinburgh; scanned copy in the British Library, London on compact disk. Many pages refer to when he lived in Abbots Langley. ^ Hastie, Scott (1993). Abbots Langley—A Hertfordshire Village. Abbots Langley: Abbots Langley Parish Council. ISBN 0-9520929-0-5. Rosehill was built in the 1820s and demolished c. 1952. The house stood on Gallows Hill where the Gade View flats are today.<...>Between 1875 and 1887, the house was home to George Turnbull whose wife survived him and lived on there until 1899. ^ Luncarty's Engineer: A short biography by John Andrews of Luncarty, West Stormont Historical Society, 2018, pages 41-50, 51 pages.